Corporate Council on Africa (CCA) convened more than 800 government and business leaders for its 11th Biennial U.S.-Africa Business Summit hosted in Washington DC from June 13-16, 2017. The 2017 Summit focused on the "U.S. Stake in Africa" and aimed to shape and promote effective U.S.-Africa trade and investment policies under the Trump Administration. Honorable Wilbur Ross, U.S. Secretary of Commerce, President Filipe Nyusi of Mozambique, and Dr. Akinwumi Adesina, President of the African Development Bank (AfDB) were some of the high-level public sector participants who advocated for greater U.S.-Africa trade and investment. Dr. Jeffrey Sturchio, CCA's Chairman of the Board and CEO of Rabin Martin, officially opened and welcomed participants to the Summit on June 14. U.S. Secretary of Commerce Wilbur Ross delivered the keynote address encouraging U.S.-Africa bilateral trade agreements. "The critical question that decision makers in Africa, including many of you, must ask is this: As these upward growth trends continue, with what types of partners do you want to collaborate?" said Sec. Ross during his keynote remarks, "I believe that, the more African nations partner with U.S. businesses, the better off both the United States and Africa will be." Sec. Ross stressed the importance of bilateral trade agreements over larger multilateral agreements and the Trump administration's stance on compliance with eligibility requirements for agreements such as AGOA. Other speakers including President Filipe Nyusi called for greater U.S. investment and partnership in and with Africa, but President Nyusi stressed the need for diverse investors in industries such as tourism and agribusiness. "It easier to enumerate what is not grown in my country rather than list what is produced. Mozambique can almost grow everything," said President Nyusi. "We urge and encourage the American business people to take advantage of the enabling business environment, and investment opportunities and potential that exist in Mozambique to diversify their interventions." The AfDB President, Dr. Akinwumi Adesina also emphasized the importance of U.S.-Africa partnerships. Dr. Adesina pushed for the U.S.-Africa business relationship to go beyond trade, to investment. "Africa offers you all 'The Deal of the Century', and America should not be left behind," said Dr. Adesina. "Think of a continent where household expenditures will rise to $1.4 trillion in the next three years. Think of the continent where business to business investments will rise to $3.5 trillion in the next eight years. Think of the continent where the population by 2050 will be the same as India and China taken together today. Think of the continent that will brim with huge demand from a rising youth population that will reach 840 million by 2050, all buying and owning consumer products." 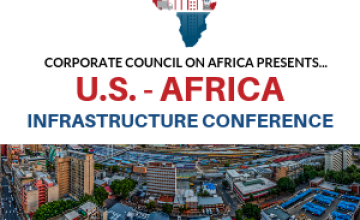 As the leading U.S. business association solely focused on U.S.-Africa trade and investment, the sessions at CCA's biennial signature event - the U.S.-Africa Business Summit - primarily featured private sector solutions and how public sector actors could support business through an enabling environment. More than 140 speakers including leading private sector executives across CCA's core sectors discussed challenges and opportunities related to the theme of the conference. "The Summit provided one of the first opportunities and an excellent platform for African leaders, U.S. and African CEOs and other stakeholders to engage with the Trump Administration on the important issues impacting the U.S.-Africa economic relationship" said Florie Liser, CCA's President and CEO. Copyright © 2017 Corporate Council on Africa. All rights reserved. Distributed by AllAfrica Global Media (allAfrica.com). To contact the copyright holder directly for corrections — or for permission to republish or make other authorized use of this material, click here.